We have designed six wedding website templates that match a selection of our Vera Wang wedding invitations, creating seamless wedding planning for couples. Hosted by Wedding Wire, these templates are free and provide 100 MB of storage—plenty of room for uploading music, photos, gift registries and more! 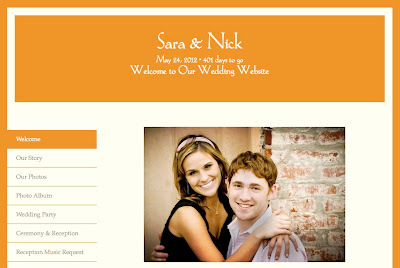 Orange is a color that stimulates enthusiasm, creativity, vitality and endurance—making it the perfect color to celebrate the beginning of marriage from invitation to website. 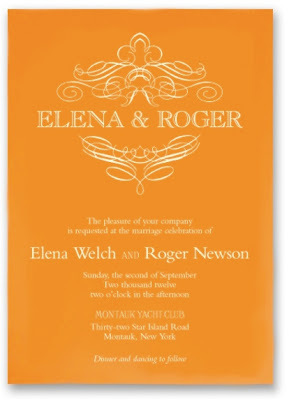 Our Vera Wang Mandarin Orange collection includes additional choices for couples stationery, a bridal lunch, cocktail party and rehearsal dinner!